Click here to donate to this project! Yes, it’s been over a year – but we have not been sleeping! 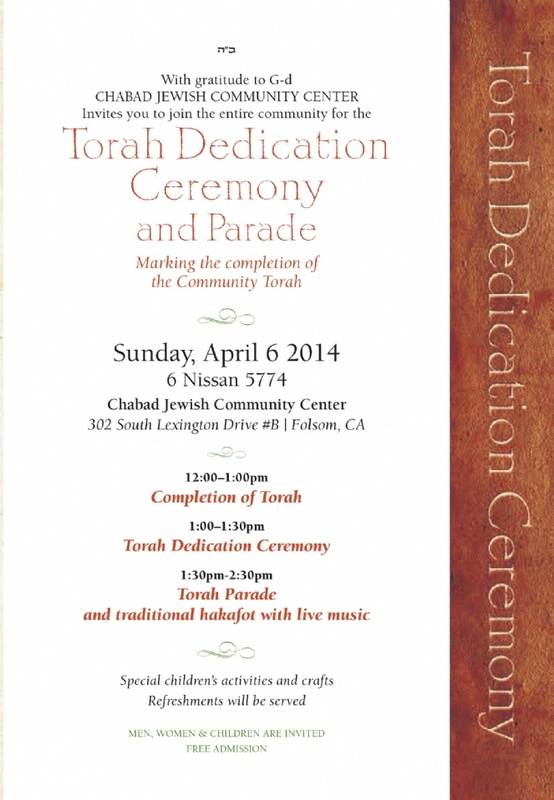 The writing of the Folsom Community Torah is almost completed and we are planning a grand completion ceremony for Sunday, April 6th. I hope to see you there. There’s one small hitch, and that's where YOU come in. A new Torah scroll can cost over $35,000 and thanks to many generous local members in the community, we've raised over $20,000! And yes, that’s why I’m now turning to you – we are less than $15,000 short of our goal. But there’s much more to it! You see, the final Mitzvah in the Torah is to write a Torah scroll. Each of us has this obligation, but it is not easy to learn how to write a Torah and it takes months of tedious work to complete. How do we fulfill the Mitzvah? Here’s the deal – a Torah is only valid if every single one of its letters are inscribed, correctly formed and intact. That’s right! If but one of the 304,805 letters are not included, the entire scroll is not useable. And this is where you come in; if you sponsor a portion of the Torah, even as little as one letter, the validity of the entire Torah scroll is thanks to your contribution. And you got it – you will then have fulfilled the final Mitzvah in the Torah. The Torah we use today is written exactly the same way the Torah was written the very first time by Moses over 3,300 years ago. This is a unique opportunity to connect in a very meaningful way with both our past and in truth, with our future too – because this Torah will be used for many years to come! There are many ways to participate in this Mitzvah, please take a moment and look at the enclosed dedication form for many options. This is the perfect way to honor a special occasion in your family, or to memorialize the passing of a loved one. To sponsor a Torah Portion is only $360 (and can even be broken up into 10 convenient payments) AND every donation of $360 or more will be forever acknowledged on the beautiful and artistic Torah Dedication Board. But even if you sponsor just one letter, this will enable us to complete the Torah and finally the local Jewish community will have a Torah scroll to call its own! Please support this important project by making a generous donation today. A special dedication form is attached along with a reply envelope. We are a 501(c)(3) charity, Tax ID 26-0588970, and your contribution is 100% tax-deductible. P.S. For the Torah to be completed on time, all donations must be received no later than March 20th. Please don’t put this opportunity “in the pile” to deal with another day - please join us today! Your support can make all the difference! Click here to make an online contribution today! P.P.S. Checks should be made payable to Chabad Folsom – Torah Project and mailed to 302 South Lexington Drive #B, Folsom, CA 95630.